A cage fighter and another man have been found guilty of murdering a 23-year-old by beating him unconscious and leaving him to drown in the River Shannon. Polish-born Patryk Krupa drowned in the Shannon outside Athlone while incapacitated with a head injury from a violent assault on June 20, 2014. 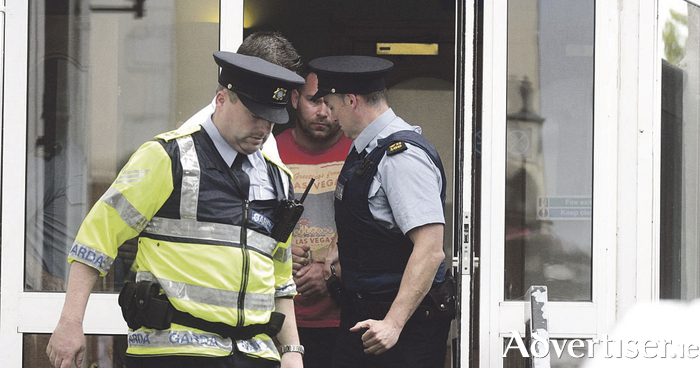 Leszek Sychulec (34 ), a Polish cage fighter with an address at Drinan, Ballymahon, Co Longford, and Andrzej Gruchacz (35 ) with an address in Warsaw, Poland had pleaded not guilty to murdering Mr Krupa at Bogganfin, Athlone, Co Roscommon. The Central Criminal Court trial heard that Mr Krupa had been walking to the gym with his two friends, when a black BMW stopped beside them and two men got out. One of these men headbutted one of Mr Krupa’s friends and told them to f*** off. They moved away as instructed and Mr Krupa disappeared down an alley with the men from the BMW. The trial heard that the friends were concerned as they knew that Mr Krupa owed some money to a man. They contacted Mr Krupa’s pregnant girlfriend and the three of them searched Athlone for the friend and partner they knew as Paddy. They were passing the spot on the Shannon where he used to fish and decided to stop there to look. They found the deceased floating face down in the water. They tried to revive him but he could not be saved and was pronounced dead at the scene. The jury heard from a witness called Kuba Zmuda, who said that he had been instructed by the two men in the BMW to find Mr Krupa. He said he was in the front passenger seat when the two men took their victim off Church Street in Athlone. He said these men beat Mr Krupa in the back seat of the car as they were driven by another man to the banks of the Shannon. Mr Zmuda said that Mr Krupa was crying, “I pay”, as they continued to beat him there, before dragging him to the river. The court heard that he was unconscious but alive when thrown in the water. Some of his bruising was consistent with his having been stamped on. Mr Zmuda did not report the attack until he was arrested on suspicion of murder, telling the court that the men had threatened him. He knew only Sychulec’s first name, but gave descriptions of the two killers, as did Mr Krupa’s friends. When Sychulec was arrested the following day, Mr Krupa’s DNA was found in blood on his watch and sock. The eyewitness descriptions of the other man involved matched that of Gruchacz. The jury was also satisfied that he was the man in passport photographs and a fake driving licence found in the car in which Sychulec was arrested. This put him with Sychulec that night. The jury was also satisfied that both men could be seen together ‘acting as a team’ in CCTV footage captured in a shop in Athlone that night. Mr Justice Tony Hunt had told the jury that it could reach alternative verdicts of manslaughter or assault against either accused. This direction came after Sychulec’s lawyer suggested that Mr Krupa might have been alive and sitting on the river bank when his attackers left the scene. However, this would not have explained the photographs the jury saw of drag marks in gravel down the bank to the water’s edge. The four women and eight men deliberated for five hours before reaching unanimous verdicts on all four counts. Justice Hunt thanked them for their “excellent” work and adjourned sentencing until June 13 when each man will receive the mandatory life sentence for murder. Mr Krupa’s family embraced each other afterwards. It is expected that his mother will return to court to give her victim impact statement at the sentence hearing. Page generated in 0.1085 seconds.